Any computer system overhaul should take the existing system into account. This allows reuse of available resources as much as possible and guarantees interoperability of the various elements comprising the system. This study will introduce a generic framework to follow in any migration of a computing infrastructure to Linux. Debian integrates very well in all types of existing environments and plays well with any other operating system. This near-perfect harmony comes from market pressure which demands that software publishers develop programs that follow standards. Compliance with standards allows administrators to switch out programs: clients or servers, whether free or not. Samba's SMB/CIFS support ensures excellent communication within a Windows context. It shares files and print queues to Windows clients and includes software that allow a Linux machine to use resources available on Windows servers. Samba version 2 behaves like a Windows NT server (authentication, files, print queues, downloading printer drivers, DFS, etc.) Version 3 works with Active Directory, brings interoperability with NT4 domain controllers, and supports RPCs (Remote Procedure Calls). Version 4 is a rewrite that can provide a domain controller compatible with Active Directory. Mac OS machines provide, and are able to use, network services such as file servers and printer sharing. These services are published on the local network, which allows other machines to discover them and make use of them without any manual configuration, using the Bonjour implementation of the Zeroconf protocol suite. Debian includes another implementation, called Avahi, which provides the same functionality. 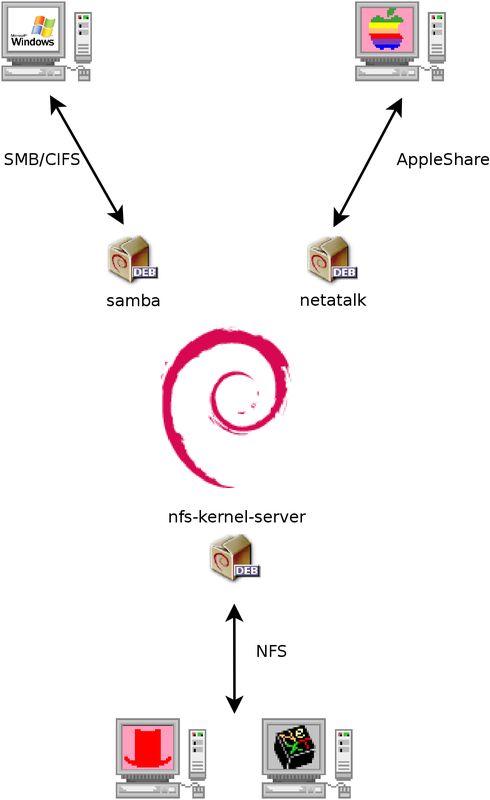 In the other direction, the Netatalk daemon can be used to provide file servers to Mac OSX machines on the network. It implements the AFP (AppleShare) protocol as well as the required notifications so that the servers can be autodiscovered by the Mac OSX clients. Older Mac OS networks (before Mac OSX) used a different protocol called AppleTalk. For environments involving machines using this protocol, Netatalk also provides the AppleTalk protocol (in fact, it started as a reimplementation of that protocol). It ensures the operation of the file server and print queues, as well as time server (clock synchronization). Its router function allows interconnection with AppleTalk networks. Finally, NFS and NIS, both included, guarantee interaction with Unix systems. NFS ensures file server functionality, while NIS creates user directories. The BSD printing layer, used by most Unix systems, also allows sharing of print queues.